Get away with some of your favorite Monster High™ character dolls dressed for frightseeing and fierce island fun! The beast friends are ready for a wild vacation in outfits inspired by jungle elements. The fashions are fierce and the accessories to-die-for! Articulation at the shoulders, elbows and knees adds to the fun with more scary cool poses and storytelling possibilities. Spectra Vondergeist™ doll, daughter of the Ghosts, looks boo-tiful in a floral print dress with chain graphic. Jewelry, shoes and headpiece mix chain pieces with leafy accents for an uhhh-mazing effect. 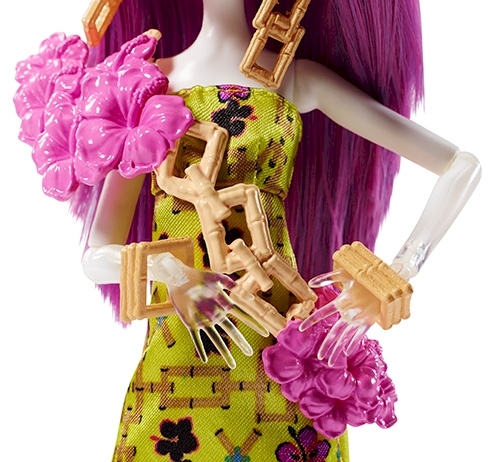 Monsterrific details, like her purple hair and pale skin, showcase her freaky fabulous flaws. Ghouls at home will love learning to embrace what makes them unique along with their beast friends from Monster High™. Collect them all for the vacation of an un-lifetime (each sold separately, subject to availability)! Includes Spectra Vondergeist™ fashion doll wearing clothing and accessories. Doll cannot stand alone. Colors and decorations may vary. Features: Get away with favorite Monster High™ character dolls! Each is dressed for a wild vacation in an outfit inspired by jungle elements. Articulation at the shoulders, elbows and knees adds to the fun with more scary cool poses and storytelling possibilities. Spectra Vondergeist™ doll, daughter of the Ghosts, looks spooktacular in a floral print dress with chain graphic. Jewelry, shoes and headpiece mix chain pieces with leafy accents for a boo-tiful effect. Monsterrific details, like purple hair and pale skin, showcase her freaky fabulous flaws. Collect all of the Monster High™ ghouls in vacation gear for the getaway of an un-lifetime. MONSTER HIGH and associated trademarks and trade dress are owned by Mattel. ©2015 Mattel. All Rights Reserved.